Wear #RedForEd to support striking Arizona teachers on Thursday! 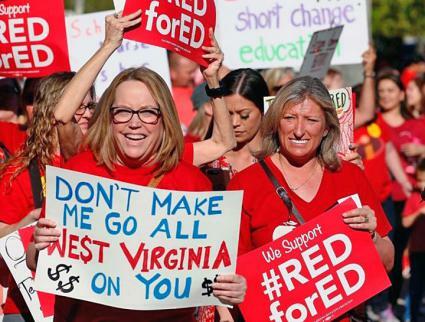 For weeks, teachers in Arizona have been wearing red on Wednesdays and “Walking In” together into their schools in a show of solidarity for public education. In response, AZ Governor Ducey promised a pay raise by 2020 – but in a statewide vote last week teachers decided that the promises were not enough and they would turn their “walk ins” into a “walk out” on Thursday! This follows, of course, statewide strikes spreading like wildfire from West Virginia, Kentucky, Oklahoma to Colorado, marching on state capitals demanding better pay and funding. Chapters across NYC will be wearing red in solidarity with Arizona teachers to send a message that they are not alone! Email more@morecaucusnyc.org if you chapter can participate – send in pictures from your chapter and post to MORE’s facebook page.